Athletes must be quick and mobile moving in all directions. Athletes performance in sports depends on their ability to quickly move in any direction to make an offensive or defensive play. Being able to quickly and powerfully move laterally will make it easier for a defender in soccer to stop a defender from moving down the field. Basketball players who can efficiently move laterally are notably better defenders and are able to draw a larger amount of charges from the offensive player. Linebackers in football can track a quick ball carrier on a outside run and make the play in the backfield. Moving laterally is so crucial to every sport and can help to drastically increase an athletes performance during competitive play. Outside of being a critical component of an athletes performance moving laterally, and more specifically drills which move laterally will force great activation in the glutes, thighs and core. Adding resistance through athlete training equipment like the Kbands Leg Resistance Bands and the Victory Ropes will place additional tension on these key running training muscles which will help athletes increase power in their stride and change of direction. In the Kbands Alley Shuffles athletes will use the Kbands Leg Resistance Bands, a partner or coach, and 1-2 Victory Ropes to add resistance to this max running training drill. Athletes and coaches will also need 8 Speed and Agility Cones placed in four rows of two. Each row of Speed and Agility Cones should be wide enough to allow the athlete plenty of room for the running training. Athletes will place 3 rows of Speed and Agility Cones (6 total cones) in 5 yards increments while placing the final set of Speed and Agility Cones 15 yards behind the third row of previously placed Speed and Agility Cones. Once athletes have placed the Speed and Agility Cones they will attach the Kbands Leg Resistance Bands just above their knees. Athletes performing the Kbands Alley Shuffle will wrap the Victory Ropes around their waist as their partner secures both hands in the Anchor Straps. For optimum athlete training coaches and partners need to be sure the Victory Rope is not placed to high on the obliques or to low around the thigh. Proper placement will ensure the athlete training activates the correct muscles during the running training. Athletes will begin the Kbands Alley Shuffles by laterally shuffling from the first row of Speed and Agility Cones to the third row of Speed and Agility Cones. Once the third row of Speed and Agility Cones have been reached athletes will begin to backpedal to the second row of Speed and Agility Cones. In unison with the athlete reaching the second row of Speed and Agility Cones partners will release the Victory Ropes, allowing the Victory Ropes to swing clear and around the athlete training. After reaching the second row of Speed and Agility Cones athletes will perform a maximum unresisted sprint 20 yards past the last row of Speed and Agility Cones. Athletes will perform 6-8 resisted sets of the drill, laterally shuffling an even number of times facing both directions. Athletes will then remove the Kbands Leg Resistance Bands and Victory Ropes and perform 4-6 unresisted sets of the Kbands Alley Shuffle. Athletes should perform additional speed training which challenges sports specific movements. 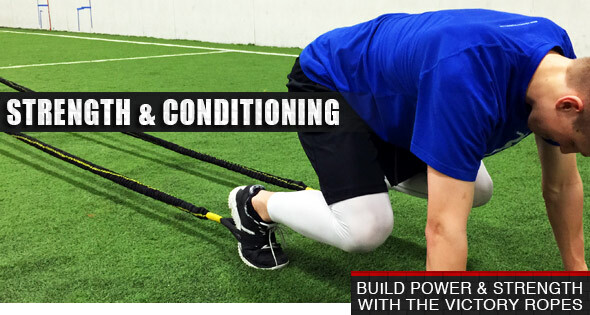 For additional running training and athlete training drills to increase athletes performance go to the Training Section and check out some sports specific drills to pair with the Kbands Alley Shuffles. For athletes to see maximum improvements in athletes performance proper form and technique must be used during the Kbands Alley Shuffle and all other athlete training drills. Athletes who can move properly through the Kbands Alley Shuffle will become quicker at moving laterally and will be able to make a smoother transition from their lateral movements into their maximum linear sprinting. As athletes begin the Kbands Alley Shuffles there are several technique and body position fundamentals which should be followed throughout this athlete training drill, and any other running training drills. When moving laterally athletes should never cross their feet, over rotate their hips or shoulders to one side, and always work off the balls of the feet. As athletes begin the Kbands Alley Shuffles they should begin the running training from a good athletic stance. This athletic stance requires the athlete to bend at the knees and hips, keep the knees behind the toes, keep a broad chest, and hands in the ready position. Maintaining a bend at the knees and hips allows for simultaneous extension and flexion at the hips and knees as the athlete moves side to side. This allows for greater power and speed and will lead to an increase in the athletes performance. Although during the Kbands Alley Shuffle the arms are not used for catching, tackling, or throwing the arms still play an important part in controlling how the body moves and how efficiently the athlete training can perform the running training drill. As the athlete training transitions from the lateral shuffle portion of the running training into the sprinting portion footwork becomes very important in how quick the transition is, and how quickly the athlete training can get up to full sprinting speed. As the athlete training transitions into the vertical sprinting portion of the Kbands Alley Shuffle athletes and coaches will want to ensure that as the transition is made the athlete training is being efficient with their foot steps. Athletes should avoid taking any “false steps” and should focus on pointing their lead foot toward their target, driving off their back foot, keeping a low chest, and powerfully pumping their arms. Following this great running training form will help athletes performance on during competition by making them quicker, better controlled, and ultimately more likely to make a play during a competitive situation.